Elderly Esthetics: How is It Different? July 26, 2016 Contact Author	Alison O’Neil, B.S., M.E., A.R.S. The fastest growing segment of our population in America is older adults. Ten thousand Americans are turning 65 every day. There are 77 million baby boomers who were born between 1946 and 1964. They are more educated, practice a healthy lifestyle, have greater literacy than prior generations, exercise, eat right and they are living longer. It is estimated that by 2030, there will be 85 to 90 million people over the age of 65 in the United States and one billion internationally. At a time when people are living longer, comfort and quality of life are not just dreams. Rather, they are rightful expectations if not also necessities of life. It is often said about the process of aging, that it is difficult. Although medical advancements on elongating life seem positive, the limitations on mobility, social interaction (isolation) and personal esthetics remain real concerns. When neglected, these physical issues lead to the decline in personal dignity and self-esteem and further lead to depression and the mental health condition known as Failure to Thrive Syndrome in many older adults. All of these factors eventually lead to increased costs in health care. The idea of aging beautifully therefore is extremely inviting. One thing we know for sure is that touch is critical for humans to thrive. Ashley Montague (1905-1999), author of the book Touching said, “The idea is to die young, as late as possible.” In a study cited on CNN they found that the people who are living to 100+ are more likely to die from “old age” listed as their cause of death than chronic disease. As recognized by Bernie Siegel, M.D., “The simple truth is that happy people generally don’t get sick.” I put that in to point out that humor and happiness are also important to living a long life. How important are esthetic health interventions such as hair, skin care, nail care and massage for seniors? People whose parents have Alzheimer’s tell me that their mother does not remember their names but she does remember her hair appointment is at 2 o’clock on a Tuesday. Throughout history, the terms hygiene and grooming were commonly used as clinical or formal terms that indicated the direct correlation of the terms we are more familiar with today as health and beauty. “Esthetic health” defines the wellness benefits derived by the recipients of services that positively affect the health of hair, skin and nails as well as their psychological impact. The side effect of being healthier is that they look better and therefore feel better about themselves. Today, more studies than ever support that enhanced appearance generally equates to an increased sense of well-being, stimulates endorphins and affects one’s overall health. Enhanced appearance generally equates to an increased sense of well-being. Since little evidence exists today, we can only theorize how the regular hygeinic maintenance in Geriatric Aesthetics* can prevent the escalation of both physical and mental health related conditions in aging through early recognition. How you ask? For example, a diabetic individual has an ingrown toenail that is cut incorrectly, and they are accidentally nicked. This wound if left untreated can lead to infection that can, if gone undetected, eventually lead to amputation of a toe, a foot or even a leg. Another complication, neuropathy or loss of nerve sensation, is a common condition that may accompany diabetic symptoms or happen independently in aging. Since neuropathy can prohibit someone from feeling the presence of the injury, this is compounded when vision loss prohibits seeing the wound. So, they cannot feel or see the injury and therefore cannot react in a reasonable way to treat the wound. The value of the intervention of the professional who recognizes this fragility and is aware of how to manage the situation is clear. Recognizing physical and mental health conditions of aging is the first of the three key components of Geriatric Aesthetics. It is valuable for personal care professionals to recognize the characteristics of common skin conditions including but not limited to: skin tags, senile purpura, milia, comedones, skin fragility (tears), bruising (trauma), wrinkles, lentigines, seborrheic keratosis, actinic keratosis, basal cell carcinoma, squamous cell carcinoma, melanoma, yellowing of the skin, general loss and thinning of hair to superfluous hair found facially and on ears, inflammatory response, eczema, seborrheic dermatitis, reduced auto immune efficiency as well as influence of medications and supplements (vitamins, baby aspirin, statins, blood thinners for heart). In addition, it is meaningful to understand the correlation of visible anomalies to the multiplicity of acute and chronic diseases. including diabetes (feet, skin fragility), heart (medications), lungs (COPD- lying flat), psoriatic arthritis, eczema (beyond dry skin), cancers, hearing loss, vision loss, dementia, the list goes on. Additional issues of importance to recognize when caring for aging clients include loss of mobility and dexterity, client positioning for breathing and back or hip pain. If a hair professional, avoid Salon Stroke Syndrome. This condition occurs when someone with arthritis in their neck extends it too far back and is under-supported in the shampoo bowl. This cuts off circulation which causes a stroke. Limited by exhaustion, pain or other, your aging clients can also tell you the length of time they can participate in a procedure. Many will even guide you in methods to support them while sitting and standing. This is where the skill of simple communication is key. The second key in Geriatric Aesthetics is knowing how to respond at your level of proficiency to your clients with these needs. Whether you are an esthetician, a personal care provider who bathes and dresses your client, a hairstylist, massage therapist or nail technician, as an ancillary care provider you should know a few basics that will help you and your clients experience be nothing less than the positive one they are expecting. You don’t need a medical degree, as these are not issues that professionals in esthetics or any of the esthetic specialities would diagnose. However, you do need to have awareness of your particular clients needs and be sensitive not to exacerbate existing conditions. And finally, if recognized you should know who to refer to for further care. You may also be aware of special products that you can refer to make their lives easier. Volunteering has been proven to counteract the effects of stress, anger and anxiety. It combats depression, makes you happy and increases self-confidence. When you volunteer, your sense of purpose increases and also helps you stay physically healthy. 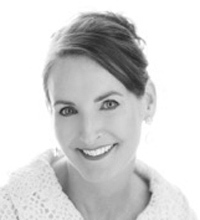 Alison O'Neil is a licensed cosmetologist and the founder of the Beauty Becomes You Foundation. She have over 30 years in the esthetic industry and is known for her work in medical esthetics and esthetic rehabilitation. She developed the first Dermatologic Rehabilitation Clinic in the country at Emory University in Atlanta, Georgia. For 11 years, she served on the Georgia State Board of Cosmetology as the esthetic member. 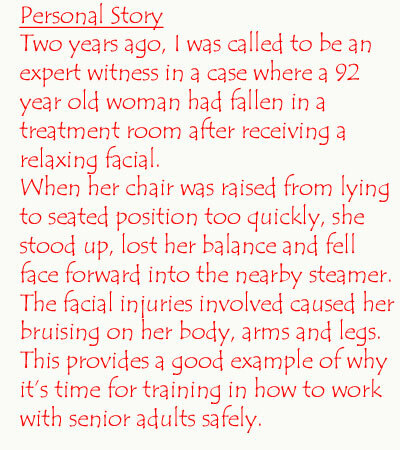 Along with the Beauty Becomes You Foundation, O'Neil founded the specialty called Geriatric Aesthetics. She was selected by L’Oreal Paris as one of the top 10 Women of Worth in America out of over 6,300 other charity founders, and she is also the recipient of the Point of Light Honor from the President of the United States and the Quality of Life Award for her role as a founding committee member of the American Cancer Society’s, National Look Good... Feel Better Program. O’Neil will present "The Intention to Serve: The Most Valuable Beauty Secret Ever Divulged" to kickoff the Advance Education Conference at Face & Body Southeast on Oct. 12, 2016. *Geriatric Esthetics is a copyrighted phase attributed to O'Neil.